Well, except for waking up about 5am with a dull headache that a couple of Advil took care of pretty quickly, my first night with a new hole in my head went pretty nicely. 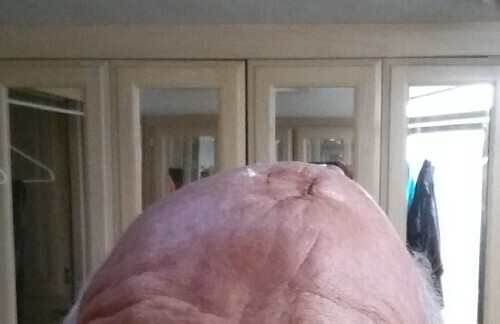 No real pain except for the occasional headache, and a feeling that the top of my head is tight, I guess because my scalp was stretched to cover the wound. 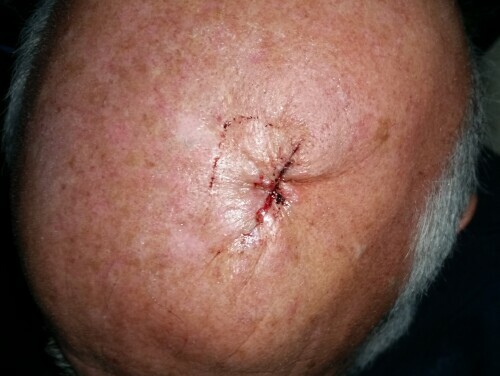 While I had the bandage off, Jan took a couple of photos, but since some people might feel they’re a little gross, I posted them on a separate page if you want to look. But don’t blame me if it puts you off your feed. Jan and I sat outside with our coffee and muffins for a little while, but, although it wasn’t real hot, it was pretty muggy, so we didn’t stay out as long as usual, much to Mister’s dismay. I don’t know if it’s because of the surgery, but I did feel kind of washed out today, so I pretty much goofed off the entire time. Finally, about 3pm Jan and I drove down to Martin’s Supermarket to pick up a few things, including more gauze and tape for my head. While we were there, I got a call from the Doctor’s office just checking up on me to be sure everything was all right. About 4:30 we headed out with Nick and Terry to have dinner at the Flippin’ Cow. a new-to-us hamburger place on Lake Simonton near our RV Park. The last time we ate here it was called Lakeshore Grill and was pretty good. Apparently the same people still own it, they’ve just changed it over to a burger joint. And a very GOOD burger joint. 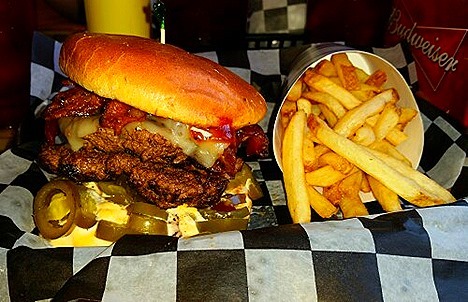 In fact, their ‘Stella Moo’ burger has been voted The Best Burger in Elkhart County, and is now in the runoff with one other place for the Best Burger in seven counties that comprise the Michiana area. The winner will be announced July 7th. And if I can find where to vote, I would certainly vote for the Stella Moo that I had, shown below. This has got to be the absolute best burger I’ve ever eaten. And Jan said the same about the one she got. We’ve already planned to go back next Wednesday because it’s $1.99 burger night and the burgers are cheaper. But as much as I like the Stella Moo, I’m also tempted to try their Hunka Hunka Burger Love. It has two steak burger patties, peanut butter, jalapeno jelly, smoked bacon, and pepper jack cheese on a toasted pretzel bun.